When you think of the most germ filled places to eat, what image normally comes to mind? Is it a visage of a dirty fast food establishment, with roaches scuttling across the floor and spreading bacteria as cooks race to crank out orders as fast as possible, cleanliness be damned? Or perhaps is it the facsimile of a greasy fried chicken joint, crawling with salmonella due to the constant cycle of raw chicken that makes its way through the restaurant? Well, it might surprise you to learn that the place that is most infested with the microscopic invaders is the very last place you would expect: your home. 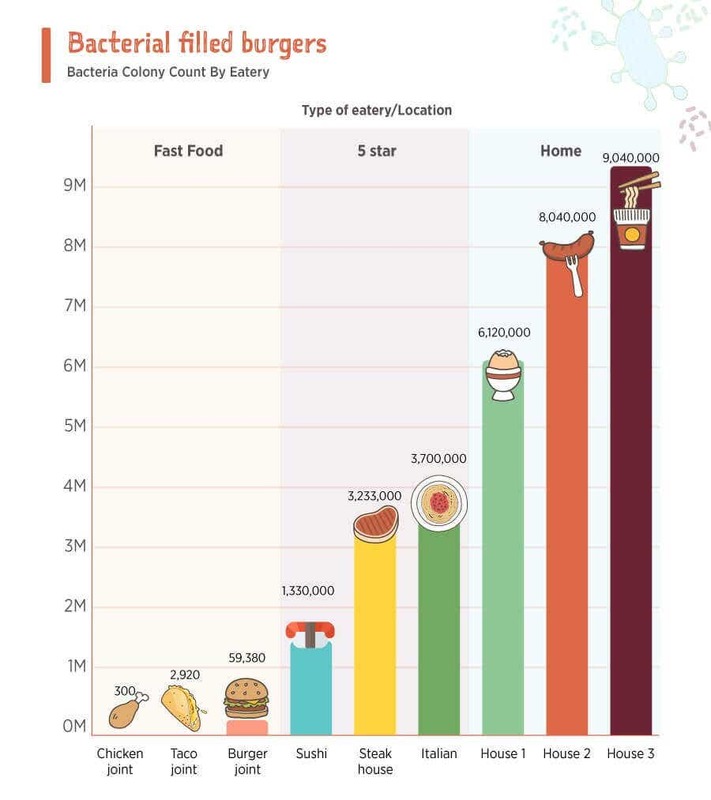 We examined an array of various five-star restaurants, fast food places, and homes and swabbed those establishments for the bacteria that they contain. Three “specimens” were chosen for each category: A chicken restaurant, a taco place and a burger joint for the “fast food” category; a sushi restaurant, steakhouse, and an Italian eatery for “five star restaurants”; and the kitchens of three houses. What we found might surprise you! It’s easy to assume that a fast food restaurant would have the worst hygiene of the bunch, but their strict daily cleanup schedule, rigorous corporate standards, and regular inspections ensure that their equipment is kept clean and their restaurants are germ-free. More expensive restaurants have to abide by the same exacting regulations, but also have to contend with washing dishes and removing those germs; a step fast food restaurants avoid by utilizing disposable utensils. Private residences however don’t have anyone coming in to check up on how clean their kitchens are. And unless your significant other keeps a close eye on the chore wheel, chances are in between work and the grind of daily life, you don’t have time to clean your kitchen every day of the week. What’s also surprising is where those germs are found. In private homes, the germs were distributed pretty evenly distributed between the water sources, the condiments, and the bathrooms. Five-Star restaurants, however, seemed like their germ distribution was divided between bathrooms and condiments. Fast food restaurants, on the other hand, had a microscopic distribution of bacteria compared to the other two, and it was mostly located in their bathrooms. In our study, the four most prevalent types of bacteria were Gram Negative Rods, Bacillus, Gram Positive Cocci and Rods. 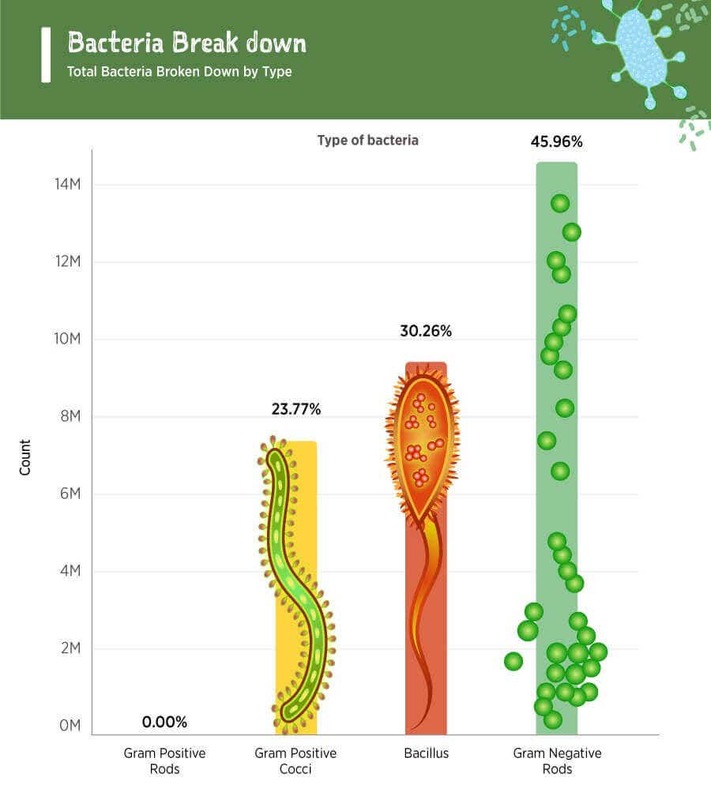 Gram Negative Rods made up almost half of the bacteria that was found at all the establishments across the board, with Bacillus and Gram Positive Cocci making up the remaining half of the bacteria and negligible amounts of Gram Positive Rods. 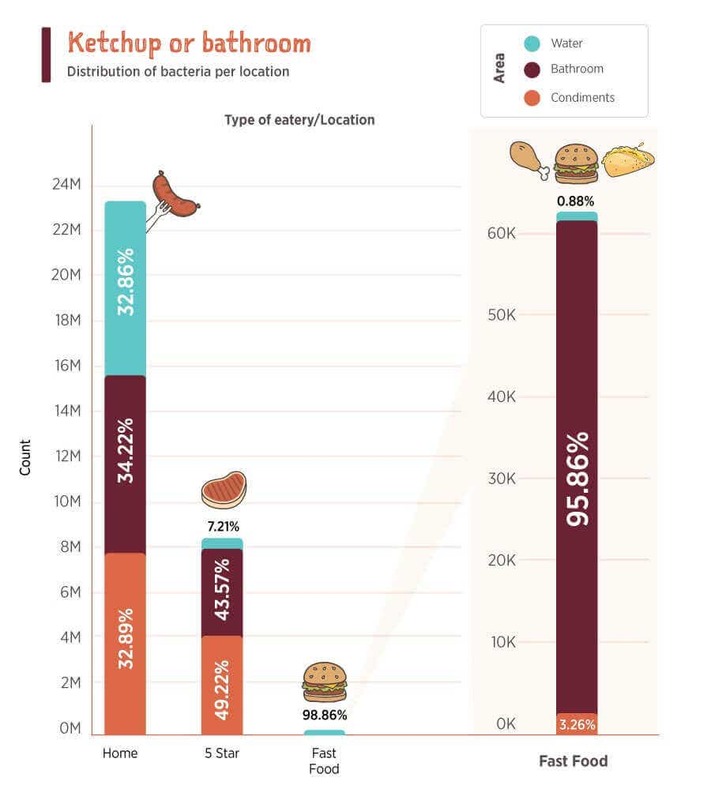 We found that while five star restaurants had a majority of Bacillus and Gram Positive Cocci located in their establishments, fast food restaurants had an overwhelming amount of Gram Positive Cocci, which makes sense considering most of their germs were found in the bathrooms. Homes, on the other hand, had almost 60% Gram Negative Rods distributed throughout their home, with Bacillus and Gram Positive Rods rounding out the rest. 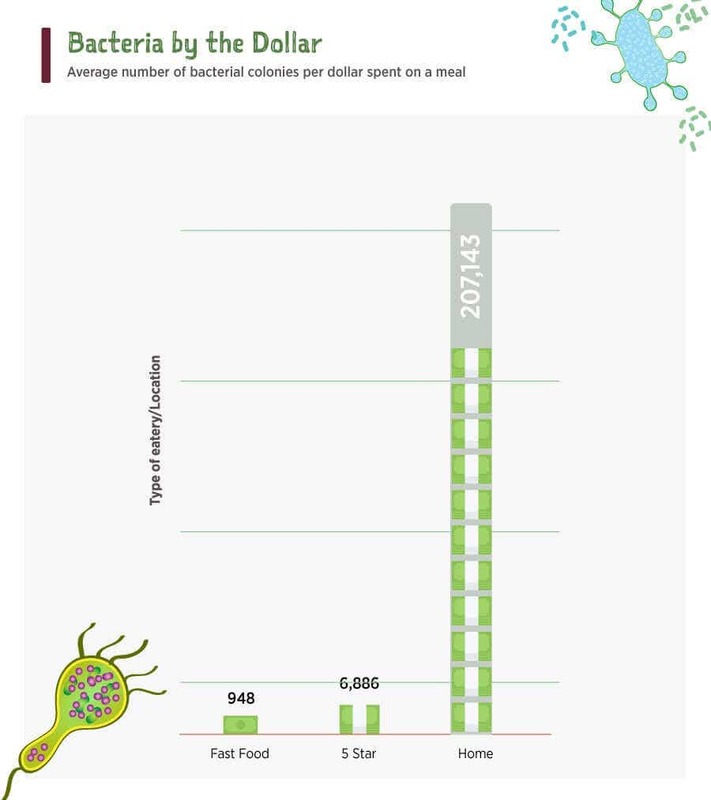 Even though we spend a lot more money at restaurants, the amount of germs located in our homes combined with the fact that we eat at home almost every day means that the money we spend on food at home ends up paying for far more of the germs that we end up consuming every day, with a whopping number of 207,143 bacterial colonies per dollar spent at home compared to the measly 948 per dollar located at fast food restaurants. It might have made you a bit uneasy to find out that your home is a den of microscopic creatures just waiting to hop on your food. Even compared to fast food restaurants, which are commonly thought to be the filthiest of the bunch, the private homes consistently came out as dirtier in the studies that we ran. Thankfully, there are a few easy solutions to massively cut down on the amount of germs that are left around the house. Establish a cleaning schedule and try to stick to it regularly. You don’t have to go wild every day and spot-clean every single day but try to set aside at least one day to clean up your kitchen. Make sure to get those hard to reach spots that most people neglect, as that’s where the germs tend to congregate. Another easy way to get rid of some of those pesky bacterium is to replace some of your old fashioned silverware and cooking utensils with cleaner, more efficient, and planet friendly alternatives such as the ones offered by RestaurantWare. And of course, don’t forget to clean your dishes as they accrue, instead of letting them pile up and create a cocktail of microbes. We swabbed germ swabbed over 27 different locations and used EMLabs for the gram stain counts. If you like the study and decide to write about it all we ask is that you like back to the original study so your readers can see the original!